Copying files from Bower_Components and Node_Modules folder to some other location in the project folder structure. Compile Less and Sass files to plain CSS. Bundle script files by concatenating multiple script files into a single file. and more. These operations are called tasks and can be automated using tools known as task runners. Currently two task runners are commonly in use - Grunt and Gulp. I won't go into too much details of the pros and cons of each or how one is better than other. My intention is to make you familiar with both of them using simple examples so that you can understand their role in ASP.NET 5. Copy jQuery library from Node_Modules folder to the Scripts folder of a project. Ok. So, let's get going. Also, make sure that you have jQuery Npm package installed in the Node_Modules folder in the local package store. In order to use Grunt task runner you need to first install grunt-cli (Grunt Command Line Interface) package using Npm. You can do that by issuing the following command at the command prompt. This command will install grunt-cli in the global repository on your machine. I will not go into the details of each and every aspect of GruntFile.js here. You can read the documentation of individual plugin for all available options and their meaning. I will briefly discuss some of the options used above. Notice the files setting under the less property. It specifies that Styles/StyleSheet1.less should be stored as Styles/StyleSheet1.css after the Less compilation. The uglify property specifies that Scripts/MyScript1.js should be stored as Scripts/MyScript1.min.js after the minification. Similarly, Scripts/MyScript2.js should be minified to Scripts/MyScript2.min.js. The concat property specifies that source files Scripts/MyScript1.min.js and Scripts/MyScript2.min.js are to concatenated to Scripts/Main.js when the task is run. The final line of GruntFile.js calls registerTask() method on the grunt object and passes a list of tasks to run as a default task. Note that the names in this list (less, copy, uglify and concat) are the same as you used in the configuration object. Now you are ready to run the tasks. Before running the tasks let's observe Solution Explorer. Observe the location of various files marked in red color. These are the "source" files on which our tasks are going to run. Notice the Scripts and Styles folders carefully. The jquery.js and jquery.min.js files from node_modules/jquery/dist folder have copied to the Scripts folder. 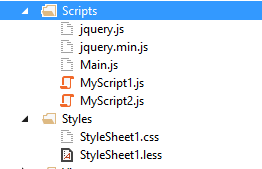 MyScript1.js and MyScript2.js files have minified versions namely MyScript.min.js and MyScript2.min.js. Main.js has been created and it contains the concatenated version of the minified files. The StyleSheet1.less from Styles folder has been compiled to StyleSheet1.css. Open the minified files in Visual Studio or any text editor. You will find that they contain the minified versions of the original source code. Now let's perform the same four operations using Gulp. Note that you are installing gulp globally as well as locally. Although strictly speaking this is not required, it makes your working with Gulp easy (something to do with PATH). As you can see Gulp plugins are quite similar to Grunt plugins. It first loads the required plugins using require() method. The code then defines three tasks using task() method of gulp object. Each task has a name and a function that performs the operations of a task. The less task specifies that source file named Styles/StyleSheet1.less should be Less compiled using less() and stored to Styles folder as StyleSheet1.css. The minify_concat task does two operations. First it reads Scripts/MyScript1.js and Scripts/MyScript2.js and minifies them using uglify(). The output of uglify() is fed to concat() and stored as Main.js in the Scripts folder. Finally, the default task is executed which will call less, copy and minify_concat tasks. Notice that, this time no separate min files are created because we fed the output of minification directly to concatenation. The Main.js will have the output that is minified as well as concatenated. That's it! Will be back with the next installment soon.